Manchester City are the hottest team in the Premier League at the moment. Although they are on even terms with Manchester United with the same haul of 18 points to share the lead after five matches, City look a bit sharper in form. Pep Guardiola’s men have racked up three straight wins, all in impressive fashion. They will now shoot for a fourth successive match when they host struggling Crystal Palace at the Etihad Stadium. After drawing 1-1 against Everton, City went on a rampage. They trampled opponents in their next three matches, first coming from behind to thwart AFC Bournemouth 2-1 at Vitality Stadium, before drubbing Liverpool 5-0 at Anfield and then the latest, clobbering Watford 6-0 at Vicarage Stadium as Sergio Aguero waxed hot with a hat-trick feat. With that fiery form, City look every inch another winners over bottom-side Palace, who have yet to win in the league after five matches this campaign. In their last five league meetings, City won four, while Palace could only win one. City’s latest win over Palace came in the form of a 5-0 pounding at the Etihad Stadium. 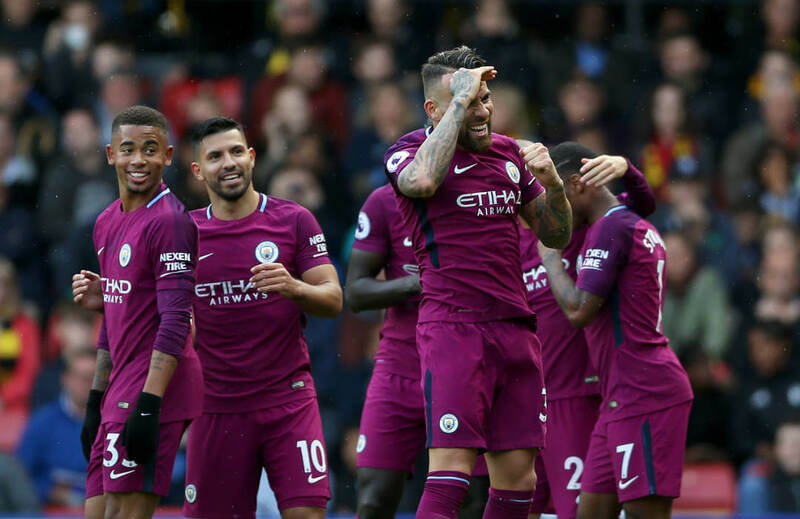 Aside from Aguero, who currently shares the top-scoring lead with Everton’s Romeo Lukaku with five goals apiece, City also boast of a powerful attacking, playmaking and defending backups such as Leroy Sane, Raheem Sterling, Gabriel Jesus, Ilkay Gundogan, Fernandinho and Fabian Delph among others. City’s defence will be tough to breach with Danilo’s presence, as well as Josh Stones’ support alongside Kyle Walker, Josh Stones and Vincent Kompany. With that kind of lineup at his behest, Guardiola need not worry a lot againt the Eagles, who on the other hand, will try to drop the upset axe as new manager rodger Hodgson prays for a miracle to claim their initial win this season. Palace’s last match in the league had them losing at home 1-0 to Southampton. But they will get some lift with the fact that they ousted Huddersfield Town 1-0 in the third leg of the League Cup last Wednesday, with midfielder Bakary Sako scoring the lone goal. Looking at all angles, we will be seeing another City victory here, unless the football gods have other things in their mind to happen. Being the heavy favourites, City are priced to win at 1.14. They are fresh from whipping West Bromwich Albion 2-1 in the third round of the EFL Cup last Thursday, with German playmaker Sane scoring both goals for City and should be on goal-poaching mode again against the Eagles. A Palace upset win pays 14.00, while a draw is worth 8.70.